Having come half way across the world to learn about participatory budgeting it was rather a disappointment to learn that it was now a shadow of its former self. 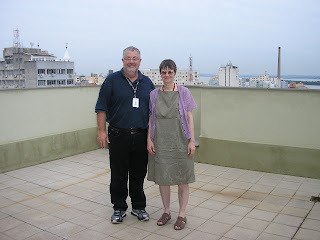 Our informant, Sergio Baierle of the Central Bank of Brazil, spoke of the emancipatory endeavour in the past tense and with some sadness, as we discussed it in the staff canteen on the top floor of his office in leafy Porto Alegre. Participatory budgeting is that most unlikely thing: a policy move where politicians actually relinquish power to the people they govern. Perhaps more unlikely is the fact that the politicians in question, the Workers' Party, were socialists who might traditionally have been expected to centralise and control power. The reality was that when they came to power in the city in 1989 expectations were vast but the coffers empty. Participatory budgeting was a system for mediating these demands. The process worked by neighbourhoods across the city creating assemblies which met to discuss how they would like to see the city prioritise its spending across a range of categories such as housing, sewerage, pavements, social services, and so on. In a simple and transparent process these priorities were then weighted according to the quality of existing services in the neighbourhood and the size of population to create proportions of need, from which proportions of the city budget followed. This idea of asking the people themselves to choose priorities for spending was truly revolutionary, particularly in a political culture dominated b clientelism, where the power of the strong men relied on the patronage they could offer in terms of new roads and schools. It was also an extremely effective means of redistribution, especially when combined with a large increase in the rate of corporation tax for those who had benefited from the increase in value of commercial property. But as Baierle shared with us, the system has diminished and virtually disappeared since the Democratic Workers' Party returned to power in the city in 2005. In 2011 none of the projects prioritised through the participatory budgeting process were funded, compared to rates of 98 or 100% in the early years. Commitment and participation have also inevitably been affected by this ineffective implementation, as well as by the increasing ability of local businessmen to game the system. Participatory budgeting is a radical idea and one that has a particular relevance in a time when money is short. The most important contribution is the genuine negotiation between citizens and their politicians about the limited nature of resources and how they should be spent. This is a clear contrast with our politics of austerity, where the message is that we cannot have anything that we want and yet the government can still follow its priorities such as a costly reorganisation of health services and a new generation of nuclear power stations and nuclear weapons. If money is short it should be our business to decide whether we want it spent on these white elephants.